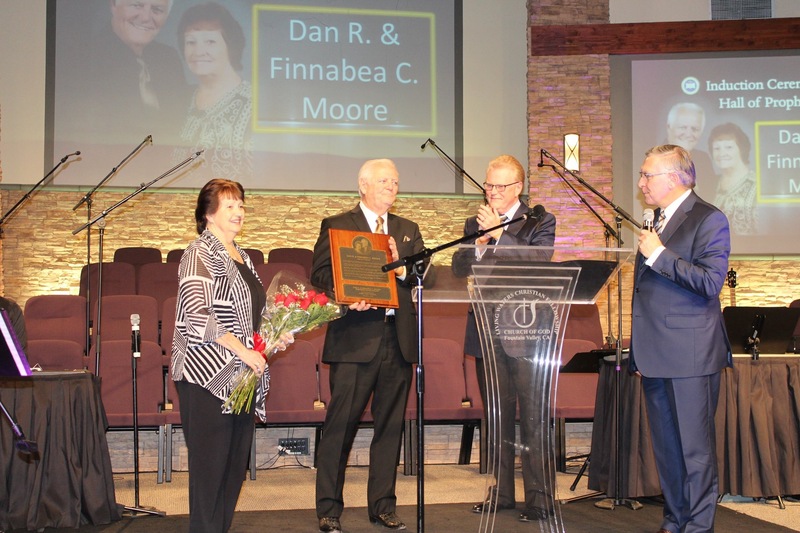 On February 7, 2019, Dan and Finnabea Moore were inducted into the Pentecostal Theological Seminary Hall of Prophets. 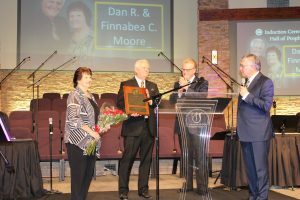 The induction ceremony, moderated by PTS President Michael Baker, convened at Living Waters Christian Fellowship in Fountain Valley, California, where Dan and Finnabea spent 38 years as lead pastor, and currently serve as Pastor Emeritus. Participating in the ceremony was Church of God General Overseer Tim Hill, Secretary General John D. Childers, California/Nevada Administrative Bishop Sean O’Neal, former administrative bishop Charles Fischer, Deena Moore Querry, and the Celebration Choir of Living Waters. The Moores pastored and evangelized for fifty-seven years in the Western United States, serving most of their ministry in the multi-cultural state of California. In addition to pastor and evangelist, Dan Moore has served the Church of God in various leadership capacities—state boards and committees, World Missions Board, the Board of Directors for Patten University and West Coast Christian College. Having a heart for missions, ministry travels have taken the Moores to eleven countries, and the first Korean Church of God (Fountain Valley, California) was established in 1980 under their leadership. Dan and Finnabea have three daughters, who, along with their husbands, are loving and serving the Lord. They have nine grandchildren and four great-grandchildren.